Windows 8 may initially frustrate and confuse you but many familiar features are lurking beneath the glossy Metro/whatever-you-want-to-call-it surface. Fortunately, Microsoft has provided a number of keyboard shortcuts so you can avoid all that swiping nonsense on your desktop PC. There’s no need to perform any complex gestures — just click the mouse or tap a key and the login password or image will float into view. Hit Win+L to lock the computer again. Hit your keyboard Window key to reveal the Metro Start screen. If the application’s not there, use Win+Q to view and search through all applications. Locate the shortcut, right-click and select either Pin to Start, Pin to Taskbar, or Send to > Desktop. Alternatively, the old Run dialog can still be launched with Win+R. Alt+Tab switches between applications. Finally, the Windows key plus a number from 1 to 0 launches the corresponding pinned application on the task bar. Use Win+Alt+a number key to open that application’s jumplist. 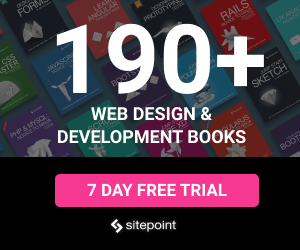 Need to close a desktop program or Metro app? Alt+F4 has been supported for as long as I can remember. Application windows can maximized and minimized using the Windows key in conjunction with the up and down cursor keys. You can dock windows to the left or right-half of the screen using Win+left and Win+right respectively. Peek at the desktop using Win+D and tap it again to re-view your active applications. Alternatively, Win+M minimizes all windows and Win+Shift+M restores them. Finally, if you’re using a tablet device, Win+O locks the screen orientation. If you only remember one hotkey, make it Win+X. 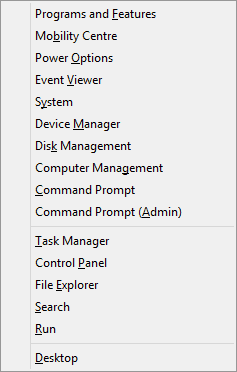 It displays a menu of useful options such as regularly-used Control Panel settings, Disk Management, Computer Management and the Command Prompt. Navigating to the shut down option is slightly ludicrous — move the mouse to the lower or upper right-hand side of the screen (which is awkward on dual monitors), then click Settings followed by Power then Shut down. Ugh. Here’s an easier option: shut the laptop lid or press your PC’s power button. Who knew? 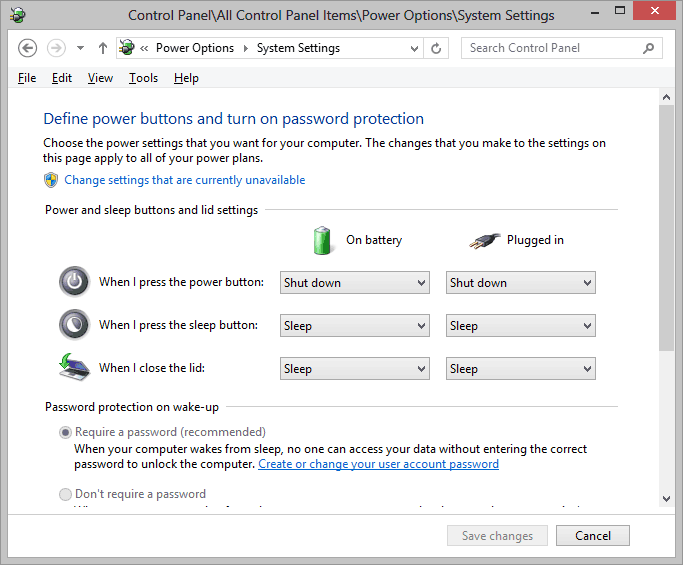 You can change whether Windows shuts down, sleeps or hibernates in the Control Panel Power Options. Click “Choose what the power buttons do” link in the left-hand pane. Have I missed your favorite Windows 8 hotkey or tip? Useful ones please … switching to another OS or downgrading to Windows 7/XP isn’t necessarily practical!